With their comical expressions and orange beaks full of fish, Atlantic puffins and their kin are some of the most recognizable birds on the planet. Read on for more puffin facts. 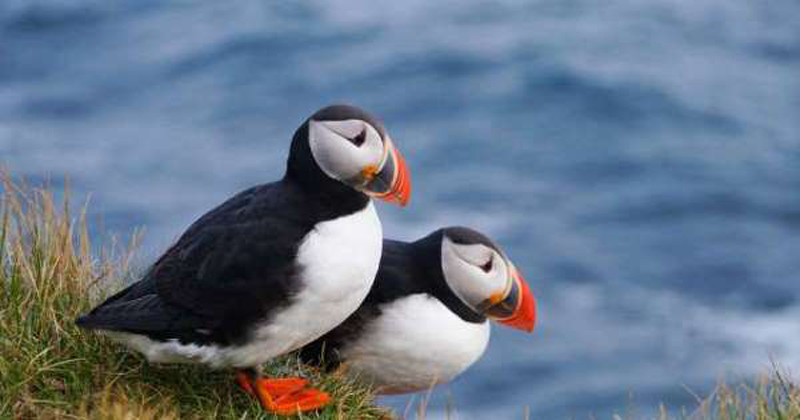 Puffins are widely regarded as the cutest birds on Earth. With their black and white plumage and large orange beaks, Atlantic puffins and their cousins may look like a clownish cross between a duck and penguin, but these birds are their own cool kind. Read on for more about the birds' diet, their chicks—called pufflings!—and habitat. 1. The name puffin refers to the young birds' roly-poly look. Puffins are called several names based on their appearance. Puffin is thought to come from the word puff, meaning swollen, because the fluffy pufflings do appear rather round. Puffins have also been referred to as the clowns of the ocean or sea parrots thanks to their amusing expression and colorful beak. The Atlantic puffin’s Latin name, Fratercula arctica, translates to “little brother of the north,” which may allude to the Atlantic puffin’s plumage resembling a friar’s robe. 2. There's more than one kind of puffin. There are four species of puffin: Atlantic puffin, horned puffin, tufted puffin, and rhinoceros auklet. The first three belong to the genus Fratercula and live in the northern Atlantic and Pacific oceans. The rhinoceros auklet, in the genus Cerorhinca, is somewhat different in its appearance but still qualifies as a puffin, anatomically speaking. The auklets live along the western coast of North America from Alaska to central California. 3. Puffins' beaks change color. Puffins’ beaks are known for their technicolor orange hue, but just before winter the birds shed the outer layer of their bills, leaving them smaller and duller. When spring arrives, though, their beaks return to their bright form, just in time for mating season. 4. Unlike penguins, puffins can fly. Puffins might resemble the black and white Antarctic birds, but they are definitely not flightless. Despite their stout bodies and short wings, puffins can fly as fast as 55 mph, but not without some serious effort: They have to flap their wings 300 to 400 times per minute to stay aloft. 5. Puffins lay one egg a year. Puffins have just one puffling each year, and they usually have one partner for their lifetime. Puffins raise their single chick during the warmer months of spring and summer and generally return to their same burrows with the same mate the following spring. 6. Pufflings are kind of high-maintenance. Being a parent to a puffling is very demanding job. Mother and father puffins have to fly long distances to hunt food in the open ocean and then return to their chick with mouthfuls of fish. Parents can supply their young with fish more than 100 times a day. 7. Special tongues help puffins catch and hold fish. Puffins can grab around 10 small fish—like sand eels, one of their favorite foods—in their beaks per dive. That rare ability is thanks to their specialized tongues and upper palates. 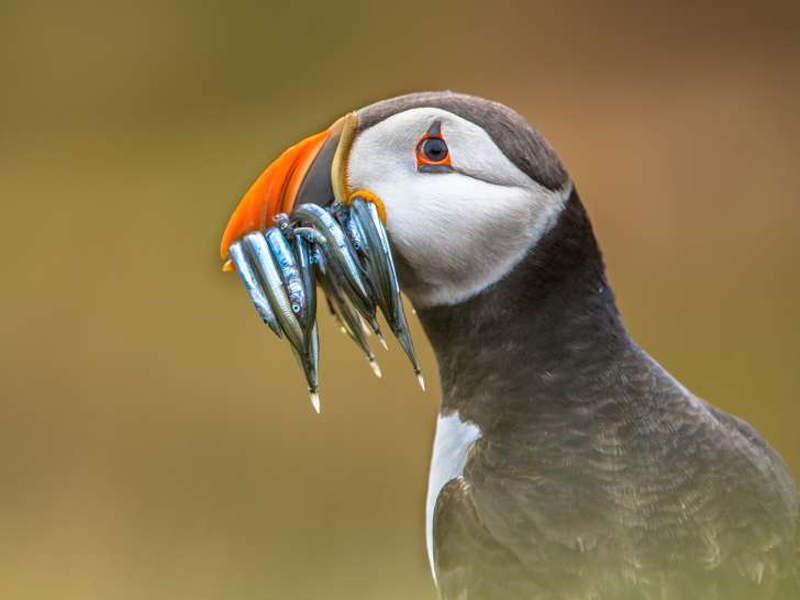 A puffin's tongue ends in a coarse section that can hold on to a fish and simultaneously push it against a spiky patch in the bird's mouth, where the prey stays put as the puffin continues hunting. One puffin in Britain set a record for carrying 62 fish in its beak at one time. 8. 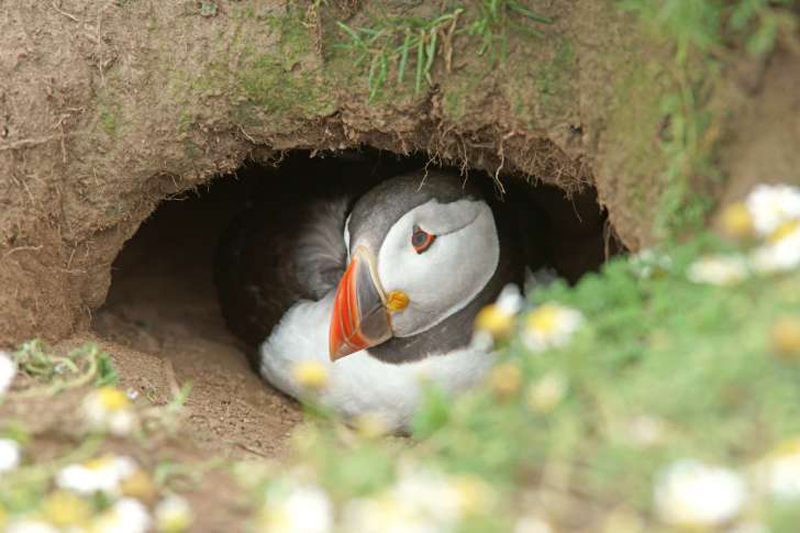 Puffins dig holes instead of building nests. Puffins don’t construct the typical cup-shaped nest to raise their puffling. Instead, they burrow into the ground, digging to a depth of about 3 feet with their beaks and feet. They will also find protected spots between rocks on steep cliffs, which protect young birds from predators. 9. Puffins can live more than 20 years. Puffins lead long lives for birds—often more than two decades. The oldest known puffin lived to be 36. The species’ maximum age is difficult to gauge because dated leg bands often corrode in the puffins’ salty habitat, or become illegible as the puffins nest in rocky environments. In fact, it’s hard to track which puffins were ever banded at all. 10. A puffin patrol helps rescue pufflings in Iceland’s largest puffin colony. Iceland is home to more than half of the world’s puffin population, and its Vestmannaeyjar archipelago hosts the country’s largest puffin colony. Each April, thousands of birds return from the open ocean to breed. Residents of the main village on Heimaey island, the only inhabited island in the group, have formed a puffin patrol to help rescue pufflings who wander into town and to provide an estimate of the year’s new chicks. In 2016, the last year for which data are readily available, 2639 pufflings were brought into the Vestmannaeyjar Fish and Natural History Museum to be examined and then released.